Hello all. 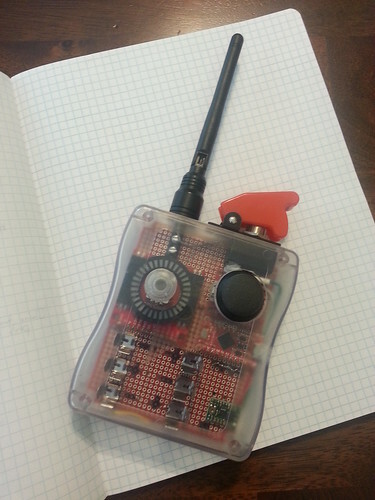 Over the New Year holidays I completed a KAP project started back in August -- a new R/C controller. This system is designed for one-hand operation, even with a glove on. And it's small enough to hang from a neck strap when I want to free my hands completely. 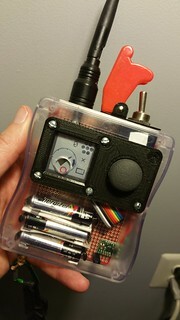 Here's a picture of the new controller along with a brief video of it in operation. I'm working on a write-up of many of the technical details in case anyone wants to do anything similar. Once that's done I'll post a follow-up message here. I'll also post some updates as this thing gets a little testing in the air. Anyway to mix in auto KAP? That's more than possible, Jim. It's the objective. I've been kind of quiet about this project because so many earlier attempts died of neglect. This time I kept the features as simple as possible, though, and managed to complete it with just one 4-month interruption. :-) Now that the basic functionality works, I wanted to share it. Adding auto modes is definitely on the road map. First, though, I think I need to replace the LED ring with another type of display. The LEDs are completely washed out in full sunlight. Beautiful Dave. I like your strategy of reducing functions and interface to the essentials. It looks like it would be fun to use in the field and it is small enough that there are a variety of ergonomic options (wearable on the forearm?). It would be great to figure out a way to make the ring LED work in sunlight. Perhaps placing it within a shading tube? Very interested in learning more. Good to see you back ! With goodies, no less. I think quite few of us here want one of those, Dave. I've been playing with using one of those thumb joysticks myself (if it's one like this) and I've got one of those HobbyKing radios sitting around doing nothing. More details please! Cris, I'm hoping this reflective LCD module can serve in place of the LEDs. I think it should be able to graphically represent the same information the LEDs provide now. (And even show both pan and tilt at once!). I have one on order and hope to be messing with it in a week or so. And the "missile switch" cover was just a whimsical addition. I've always wanted to use one of those on some sort of project and here I finally got my chance. It does look a bit ominous, though, doesn't it? If this doesn't work as a KAP controller perhaps I can sell it to Hollywood as a prop. Dave, I started working on a technical write-up of this last night. I think you'll enjoy it in a couple days. That looks like the same, or similar thumb joystick. And I must say, it feels quite right, ergonomically. I can even use it confidently with my KAP glove on. Great stuff Dave! Love the elegant packaging and all those nice parts! Inspiring too! This is fantastic! I had just begun working on the same thumbstick controller wondering why there wasn't more of this around. Excellent work! My plan is to use an iPod touch to control the camera. This can velcro above the controls to still allow single hand control of the entire system including all camera settings. Dave, my thoughts after seeing your video were to use this as a front-end for an autoKAP subroutine. After directing the camera where you want it, you push the button to initiate a pre-determined SDM/CHDK routine basically to shoot a series of photos in the chosen region. So, instead of shooting 400 pictures in a flight, you shoot small bursts (say 8 or 10) of pictures to be combined later for the best composition. Then you redirect the rig to a new region. Congratulations on your fantastic work! You guys are killing me. I want to go implement the multi-shot and autoKAP features right now but I promised I would post the documentation first. The doc is shaping up well. It's missing some diagrams that I should have finished over the weekend. There are some bits missing still, so I'll be working on a final draft to upload later. But, with my schedule this weekend, I need to set this aside now and it might be a few days before I can get back to it. I thought you might like to see what's there now rather than wait. Please post any feedback here in the forum. First rough draft? Whoa, that's very extensive documentation already, beautiful work! or barter help when the time comes. Terrific Dave - I'm happy to wait for the next installment! Can't understand a lot of your document but your finished handset is brilliant. When it is possible to buy ? From BROOKS or from KAPSHOP ????? We would love to have this system in our store. And I would love to see this in your store, Peter And in everyone's hands in the field. Unfortunately, as it exists now, the system isn't even remotely manufacturable. Another hobbyist could build something similar with a large investment in time (and money for parts and tools), but to build enough to stock KAPshop wouldn't be feasible. I'm already thinking about redesigning it as a product, though. The proper thing to do would be to finish development and testing on this article, then figure out how to bring a new version to market. Lets keep that idea on the back burner for now and see what happens. David, I don't think you're all that far from making a product out of this. One thing you might consider is using one of the Texas Instruments ultra low power MSC430 microcontrollers in place of the Arduino board. Perhaps the MSC430G2553, which comes in a 20-pin DIP for about $3. I think it will do pretty much what the Arduino board does. The chip operates at 1.8-3.6 volts, and has its own clock generator (1 to 16 MHz, no crystal required), flash memory, ram, two timers, ADC, a comparator, and some other stuff. So instead of an Arduino board at $20, you could use a single chip that costs $3. Then you'd have a "normal" single layer circuit board. TI sells a LaunchPad experimenter board for $10 including a sample 2553, which lets you program the flash memory via USB from Windows or Linux, and there are a couple free C/Assembler compilers for it. Otherwise, it looks like you just need to find RF transmit and receive modules that don't involve taking apart a Hobby King transmitter, and then lay out a PC board. Congratulations on doing this. It's really first rate. I've been busy working on some autoKAP and multi-shot sequences. The groundwork is done but not all sequences are implemented yet. And I received my new LCD display and have started writing code to drive it. I look forward to seeing an updated video, and the documentation. Thanks, wayback. I have just a few items to finish up then I'll make a new demo video. Also, I need to revise and complete the documentation. That hasn't been forgotten! Perhaps I can get the video done this weekend? We shall see. Can't wait to try to make one. Looking forward to your much needed information. Sorry to keep everyone waiting. I finished most of the needed software additions Saturday. But Sunday didn't afford any time to make the demo video or update the documentation.